Precision medicine used to counteract oxidative stress in stroke animal model. Researchers have known that transplanted human umbilical cord cells (HUCBCs) can have a restorative effect on the brain and brain function following a stroke. However, just how the cells exert their therapeutic effects has not been clear. Now, a research team from the University of South Florida using animal models of stroke has found that the HUCBCs are most beneficial in preventing neuron loss when the Akt signaling pathway is activated by secretions from the HUCBCs and that Akt activation subsequently impacts a specific gene involved in reducing inflammation. A reduction in inflammation can help neural cell survival following a stroke. The opensource study is published in Cell Transplantation. The team state that stroke is the fourth leading cause of death and the leading cause of disability in the U.S. The goal of the study was to identify HUCB-induced neuronal genes associated with cell survival following a stroke and to discover just how soluble factors secreted by HUCBCs induce critical signaling pathways in neurons that enhance cell survival. The observations show that HUCB neuroprotection is dependent on the activation of the Akt signaling pathway that increases the transcription of the Peroxiredoxin-5 (Prdx5) gene. This finding suggests that HUCBC therapy could be a promising treatment for stroke and other forms of brain injury when gene expression is modified to promote neural protection. While pathways other than Akt have been shown to be important in cell survival, Akt has been shown to be more important than others because it works to activate Prdx5, an antioxidant enzyme gene with the primary function of reducing hydrogen peroxide and inflammation. Prdx5 plays a significant role in the regulation of the transportation of certain molecules in apoptosis, or programmed cell death. Antioxidants have been shown to limit cell death and levels of Prdx5 have been found to be lower, and inflammation higher, in patients with more severe strokes. This finding implies that in severe stroke Prdx5 is either degraded or its production is impaired. Prdx5 may be an important component of the antioxidant effect of HUCBCs and, therefore, a candidate for therapeutic targeting of oxidative stress in stroke. The researchers concluded that HUCBCs rescued neural cells and prevented neuronal loss in rats modeled with stroke by increasing the transcription of genes related to survival and repair by inhibiting inflammation. It was the ramping up of Prdx5 through the Akt pathway that facilitated this effect. The neurosurvival action of secretants through Akt signaling not only ramped up transcription of Prdx5 and other survival-associated genes, but also inhibited genes that play a detrimental role in stroke injury. The team surmise that this study provides hope of a treatment for stroke using HUCBCs, which are easily obtained, avoid ethical issues and have a minimal chance of rejection compared with other allogeneic stem cells, in order to rescue endogenous cells and restore function. The study also highlights the need for further understanding of the role of oxidative stress in the pathogenesis of stroke. HUCB cell-mediated neuroprotection depends on activation of the Akt signaling pathway. Significant neuronal loss was observed in neurons exposed to OGD (A). 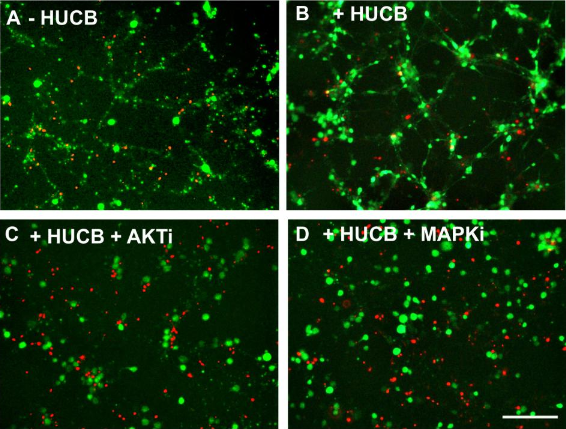 HUCB cell treatment rescued neuronal loss (B) while HUCB cells lose their neuroprotective effects after adding Akt inhibitor into the culture media (C). Addition of MAPK inhibitor failed to influence HUCB cell-mediated neuronal protection (D). Human Umbilical Cord Blood Cells Induce Neuroprotective Change in Gene Expression Profile in Neurons after Ischemia through Activation of Akt Pathway. Willing et al 2014.